How do you use the ToonDX Effect in MMD? Where do you get the MME ToonDX Effect? How do you make the models look like a cartoon? How to use the ToonDX Effect. 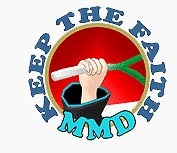 I’m a longtime fan of the MMD Cup. Those of you who don’t know, the MMD Cup is a competition on NicoNicoDouga (YouTube’s Asian counterpart). It is held twice a year. This last cup (the 11th) just finished. I noticed a trend in the effects used. The effect reminded me of one called the ToonDX effect. What the ToonDX Effect does, is make your models look more cartoonish. If you have seen the 2006 movie A Scanner Darkly or the 2013 anime Aku No Hana, you’ll know what I’m writing about. These two works use a technique called interpolated rotoscope. I know you’re thinking; “The models are already cartoon like. Why would you need to do this?” It’s more about aesthetics than anything else. It’s just fun to look at your models in a different light. I uploaded a video using this effect at our YouTube Channel. Just click on the picture. You can download the ToonDX Effect at Beam man’s site: http://www43.atwiki.jp/beamman/ . Before you start downloading this effect (or just about any effect) make sure you have properly installed MMEffects in MikuMikuDance. Please see my colleague Noko2’s article: https://learnmmd.com/http:/learnmmd.com/download-mme-install-mikimikueffects-add-effects-mmd-7-39/ for details regarding downloading and installation. After you have downloaded the ToonDX Effect make sure you place it in your Effects folder. If you don’t have an Effects folder then make one and put all your effects there. Giving Your Models a Toon Up. Open up MikuMikuDance and load all your models, .wav, and motion data. The ToonDX Effect you would load last. Next, click on the MMEffects button located at the top right of your screen. Now click on Effect Mapping option. Another window will open displaying your model’s name. Select the name and click on the Set Effects button and go to your Effects file and choose the ToonDX Effect. You should have two folders listed as MultiEdge and six FX files. The MultiEdge folders will have to wait for another article. For now, load all six FX files on to your model. This can be a little tedious but stick with it. You can now press Play and enjoy your handiwork. As you load these files notice how they affect your model. You might find a look you could use in a different context. So think outside the box and keep an open mind. Model: Chinese New Year Rin from VocaloidChimi. How do I load all 6 files onto my model? I can’t seem to fit em all in.